A night of hilarity for a spectacular charity: Help Refugees. Help Refugees is not simply another aid organisation. It’s a group of everyday people, taking joint action to improve lives of refugees throughout the world. In less than three years, it has become the biggest facilitator of grassroots aid in Europe, with more than 80 projects across the continent and the Middle East. Poet, Edinburgh Comedy Award winner, star of Taskmaster, Peep Show, Detectorists, Inside No. 9, Charlie Brooker’s Screenwipe and more – not to mention his role as ‘Sidekick Simon’ in This Time With Alan Partridge, Mid Morning Matters and Alpha Papa – Tim Key is swiftly becoming a national treasure of British comedy. Actor (Dead Boss, Cardinal Burns, Trollied), writer and stand-up supremo (the first female winner of So You Think You’re Funny in two decades, in 2012, and an Edinburgh Newcomer nominee a year later), Aisling has also appeared on Taskmaster, The Great Celebrity Bake Off, Would I Lie To You? Sunday Brunch, and was the first female team captain on 8 out of 10 Cats. Comedian, actor and self-professed “Steve Tyler lookalike”, Ellie is star of BBC Two’s The Mash Report and ITV2’s Plebs, having previously appeared on QI, Mock the Week, 8 out of 10 Cats, Live at the Apollo and Would I Lie To You? Creator of CBBC’s Big Babies, a regular on Shakespearian sitcom, Upstart Crow, and the warped mind behind his on-stage alter ego, The Herbert – “a grinning cockney prat.” Nominated for the Edinburgh Comedy Award in 2017, he is also the lead actor in BBC sitcom, Mister Winner, out later this year. Mock the Week regular, The Premier League Show reporter and Roast Battlesurvivor, Rhys has also written for Russell Howard’s Good News. He was previously a finalist in the Laughing Boy New Act Competition and Comedy Central’s Funniest Student. Stand-up’s answer to Mark Kermode, Brett Goldstein is creator and host of the Films To Be Buried With. He also wrote and starred in SuperBob, and previously co-starred in Derek, Uncle, Drifters and Doctor Who. Lauded as “a black female Jack Dee”, Twayna pairs her signature downbeat style with deliciously honest material. She was a Leicester Mercury Comedian of the Year nominee in 2016, and was among the runners up for the prestigious New Acts of the Year Show (NATYS) award in 2014. An ex-New Yorker/yogi living in London, Abigoliah Schamaun is, by her own admission, “frank, funny, and unapologetic.” Named among The List‘s ‘Top 5 Up and Coming Female Comedians’, she was nominated for the Malcom Hardee Cunning Stunt Award in 2016, having purchased a vast amount of advertising space, then plastering it with critic-baiting fake reviews. Line-up is subject to availability. We reserve the right to add, withdraw or substitute acts at any time and if there is a change of act (headline act or supporting act), sadly no refunds are due. 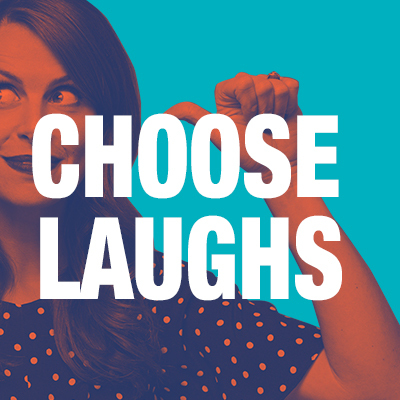 Follow @chooselaughs on Twitter for updates on the event.